100-240V voltage is designed for widely use. Large moving head light design, stable performance. Electronic automatic focusing for easy control. Shaking and lighting with changing rainbow colors . CE certification, safety, environmental protection. Scanning angle: Horizontal scan: 540°,Vertical scan: 270°. Pan/Tilt speed can be adjusted for the different atmosphere and scenes. Excellent heat dissipation system and cooling fan on the back to resist overheat. Gobos will be changed along with your music,let your party be more funs. Product Size: 9.44" x 9.44" x 14.56"
Packing Size: 13.77" x 13.38" x 14.76"
30W LED provides a ultra bright intense, great for big stage or big KTV room,while others only 15W. 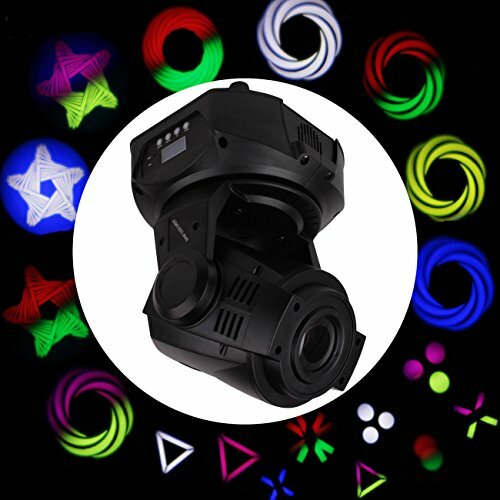 Colorful patterns add more romantic,this moving head light is perfect for wedding party and university dancing party. Comes with 2 mounting brackets to hang on truss or install on a wall and 4 mats make it can be placed on the ground, convenient for use. Widely used in the stage and other occasions,like club, DJ,show, home party, ballroom, ktv to enliven the party's atmosphere. If you have any questions about this product by MountainNet, contact us by completing and submitting the form below. If you are looking for a specif part number, please include it with your message.